Posing as one of Robin Hood's thieves to avoid the evil Lord Gisbourne, Scarlet has kept her identity secret from all of Nottinghamshire. 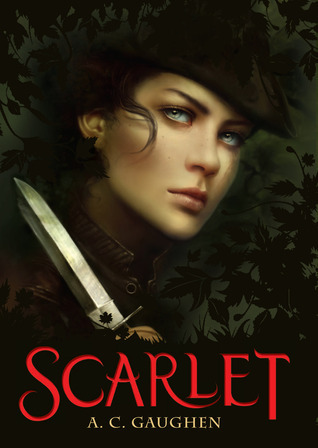 Only her fellow outlaws, John Little, Much and Robin Hood know the truth - this agile thief is no boy but in fact a fearless young woman with a secret past. But Scarlet is torn between her desire to get as far from Lord Gisbourne as possible and a strong sense of responsibility to those who took her in when she was first on the run. As Gisbourne draws closer to Scarlet and puts innocent lives at risk, she must decide how much the people of Nottinghamshire mean to her, especially John Little and Robin, whose quick smiles and temper have the rare power to unsettle Scarlet. Full of exciting action, secrets and romance, this imaginative retelling of the classic tale will have readers following every move of Robin Hood and his band of thieves. I love Robin Hood, but somehow the more recent retellings have never really captured my imagination - apart, of course, from the classic kids' TV series Maid Marian and Her Merry Men, still one of the all time greats of British chilrens' telly. (Slight tangent there, sorry!) This looks intriguing, with a really striking cover and some very impressive early reviews on Goodreads, so will hope it's the one that finally does it for me! I haven't heard much about this one, but the fact that it's about Robin Hood has me intrigued!